U.S. Rep. Danny Davis joined by a number of local, county and state leaders to call for resources to end violence in Chicago neighborhoods. Leaders from all levels of government gathered Tuesday to lament last weekend’s deadly killings – 12 people were killed across the city, including three in Austin – and demand more resources. 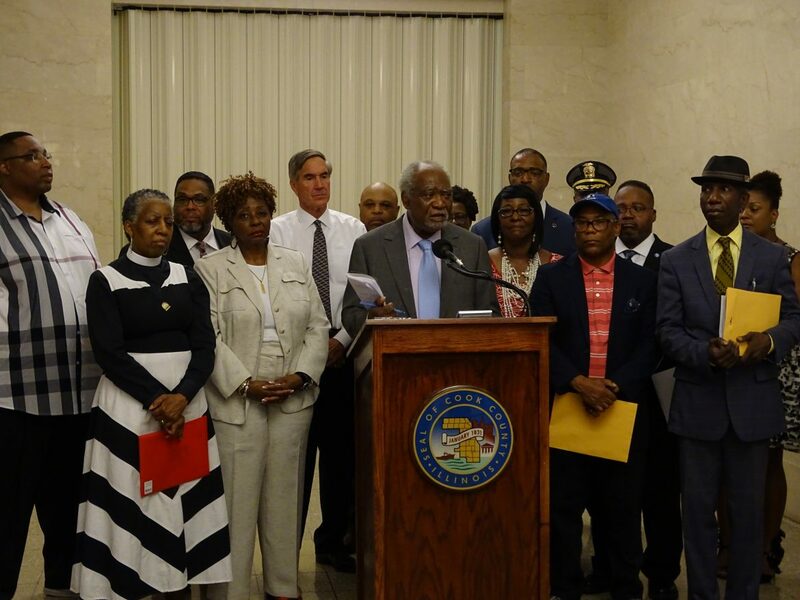 More than a dozen African-American officials – joined by Cook County Commissioner Tim Schneider, co-chair of the Illinois Republican Party – put the spotlight on longstanding problems that contribute to violence, including poor access to education, and jobs. Access to early childhood education and other resources in Austin and other struggling neighborhoods can greatly contribute to violence, U.S. Rep. Danny Davis said. Schneider, who reached across the political aisle to organize Tuesday’s gathering with Cook County Commissioner Richard Boykin (D), said violence within the city is not a Republican or Democrat issue, but an issue that affects everyone in the county. Boykin said the communities that most frequently see violence deserve the same protection offered to North Side residents and shoppers along Michigan Avenue and concert goers at Lollapalooza. Dr. Janette Wilson said the “values” problem, which Mayor Rahm Emanuel called out when addressing last weekend’s violence, is not just present in violent communities – but one that is present in the system that has prevented the allocation of resources to communities that need it most. “We have a values problem when people have no access to health care and you close mental health facilities knowing full well that many of our children face post-traumatic stress syndrome,” said Wilson, a senior adviser to the Rev. Jesse Jackson Sr. at Rainbow PUSH/Coalition. Tamara Stanford also attended the meeting, where she askedthe public for help in the search for her 31-year-old-brother Jeremy Stanford, who has been missing since July 20. Standford said multiple people witnessed her brother being beaten unconscious and driven away from a gas station in Austin, but no one has stepped forward with information out of fear of retaliation. Five teens were awarded college scholarships by a panel of judges in BUILD Chicago's 14th annual speech contest. Cook County Commissioner Richard Boykin said he decided to host the meeting after a number of people throughout the 1st District said there is a need for a community court in Austin. The Chicago City Council recently approved a $1 million grant for Catalyst Circle Rock Elementary School, 5608 W. Washington Blvd., to turn a vacant auditorium into the Glen & Lonni Kehrein Center for the Arts. State Rep. La Shawn K. Ford and the leader of the UIC Great Cities Institute will stand alongside victims of violence this morning to offer solutions.